Danger: Be aware of extremely hazardous or lethal situations. air vents may cause thermal problems. 3.5mm audio cable. You can adjust the volume on the external audio device. The stand provides stability to the computer; it is not a removable part. device. Use of another AC adapter may cause a fire or explosion. computer might not have all connectors shown. models are equipped with this connector). 1. Plug the power adapter cord into the back of the computer. 2. Plug the power cord into the AC adapter. 3. Plug the power cord into an AC power source. Press the power button on the bottom left of the screen to turn on the computer. 1. In Windows 7, Select вЂњStartвЂќ вЂ“ вЂњControl PanelвЂќ. 2. In Control Panel, select вЂњHardware and SoundвЂќ. 3. In вЂњHardware and SoundвЂќ window, select вЂњTablet PC SettingsвЂќ. 4. In вЂњTablet PC SettingsвЂќ dialogue, click вЂњCalibrateвЂќ button. calibration points that are shown in sequence, to finish the calibration. Note: Do not touch it via hard objects like finger nails. action performed by clicking the left mouse button. the action performed by clicking the right mouse button. screen will show the вЂњForwardвЂќ or вЂњBackвЂќ icon. вЂњEnable multi-touch gestures and inkingвЂќ. вЂў Enable / disable touch points. вЂў Touching the correct place on the screen. вЂў The speed of movement. вЂў The time interval from when the screen was last touched. of the hard disk drive will remain unchanged. install the operating system on the C partition. liable for any losses arising there from in any way. computer to the system default or a previously backed up state. Lenovo Rescue System open, then select OneKey Recovery. computer. Restart the computer and enter the system. were shipped with your Lenovo hardware. Lenovo Rescue System open, then select Drivers and Application Installation. 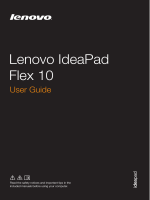 Follow the screen prompts to install the Lenovo Drivers and Application Installation. Click Install to start installing the Lenovo Drivers and Application Installation. manual installation function can be used. ConnectionвЂќ in the network connection modes. 1. If you select вЂњADSLвЂќ input the username and password of the ADSL connection. Set a password when you access the Password Management for the first time. restore your system from this image file. partition according to the prompts. restore to a system backup point or the initial state. recovery disc from current system. Follow the screen prompts to create recovery discs. computer model that you purchased. computer is in standby mode, sleep mode or turned off. PC camera and is available only after the camera is installed. 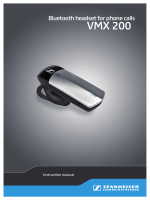 1) Click Start в†’ All Programs в†’ Lenovo USB2.0 UVC Camera в†’ vmcap. please confirm that preview in the options has been checked. 3) Confirm that Devices в†’ Lenovo USB2.0 UVC Camera has been checked. the camera to ensure the whole face is displayed in the video capture window. 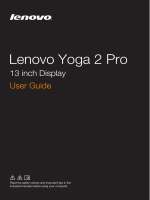 Click Start в†’ All Programs в†’ Lenovo в†’ Lenovo Dynamic Brightness system. display delay time according to your needs. and the display. It will alert you automatically when you sit too close to the display. Click Start в†’ All Programs в†’ Lenovo в†’ Lenovo Eye Distance System. 1. Ensure the lens of the camera is exposed and not covered. 2. Ensure your eyes are exposed and not covered. Wear glasses may affect the accuracy of the face image verification. installation procedures and ensure that the part is correctly installed. вЂў If a peripheral device does not work, ensure that the device is properly connected. вЂў If an error message occurs in a program, see the programвЂ™s documentation. Problem: You need to change display property settings. вЂў Set resolution and colors by using Display Settings options. or other computers that may be generating magnetic interference. 3. 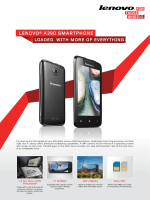 If the problem persists, consult with Lenovo Service. Problem: No sound from integrated speakers. that the sound is not muted. Problem: You are unable exit a running program normally. optical drive is supposed to be able to read this type of CD or DVD. 1G is 1000M, while the actual capacity 1G is 1024M). вЂў Do not use the keyboard until it is dry. вЂў Spray water directly onto the surface of the monitor or inside of computer.